What has been bringing buyers to Bid on Equipment through the month of February and what are they looking for when they are here? This last month we noticed a large increase in interest inUsed Packaging Equipment including Fillers, Cappers, and Bagging Equipment. What’s the Difference Between a Continuous and a Batch Freezer? When most people think of a freezer, they think of an appliance that keeps things cold. They think of something that preserves and keeps food from spoiling until it’s time to be cooked and consumed. Continuous and batch freezers also accomplish this task, but unlike conventional freezers that are combined with your refrigerator or stored in your basement, these freezers also carry out the important task of creating food as well. Specifically, they work to produce frozen treats, like ice cream, gelato and even sorbet. Fitting to the name, a continuous freezer is one that produces ice cream without interruption. This differs from the batch freezer type, which only produces the delicacy in pre-determined amounts. Because of this, continuous freezers are ideal for entities that are in the business of producing large quantities of ice cream. Unlike the batch freezer, continuous freezers don’t specialize in making short runs of various different types of ice cream flavors. Many continuous freezers, for instance, can create endless batches in a single run, so long as mixture is added to the machine. Specifically, continuous freezers are automated pieces of heavy equipment that are capable of producing either water-based or milk-based ice cream by adding air to the process. Air is added to the process via a pump while it is being beaten and frozen, making it feasible to attain aeration levels of well over 100 percent. Continuous freezers are simple to operate, being that you can essentially program the machine and not have to bother with it until its run is done, and also fairly easy to move around the facility floor. They are typically fabricated from stainless steel, which adds to their durability. Bottom line: Continuous freezers are designed for the large producers of ice cream who supply the product to stores and other locations. The uninterrupted nature of how the machine works makes large-scale production of these frozen treats easy to achieve solid profitability. Unlike a continuous freezer, batch freezers are better suited for short runs of ice cream, as these types of freezers work to only produce pre-determined amounts of a particular type of frozen delicacy. While the batches can be programmed to vary in size, generally speaking, they aren’t close to the same production scale as you’d get from a continuous freezer. That doesn’t necessarily mean they don’t serve a purpose, but batch freezers aren’t the ideal product for large scale producers of ice cream and are instead better intended for the small gourmet shops and stores that wish to make their own product. Specifically, many batch freezers are a step up from a household ice cream maker, with the capacity to make anywhere from 5-6 gallons of the treat at a time. Again, that’s a far cry from the endless gallons of a continuous freezer, but then again batch freezers are intended for a different environment. Think of a batch freezer kind of like how you think of a washing machine – batch freezers somewhat mirror washers in appearance, and also work in a similar manner to such appliances. Batch freezers freeze the ice cream from the outside in, as the mixture is mixed and stirred by a rotating blade once inside the batch freezer chamber. Cold coils that are integrated into the batch freezer’s casing allow for the freezing of the ice cream. 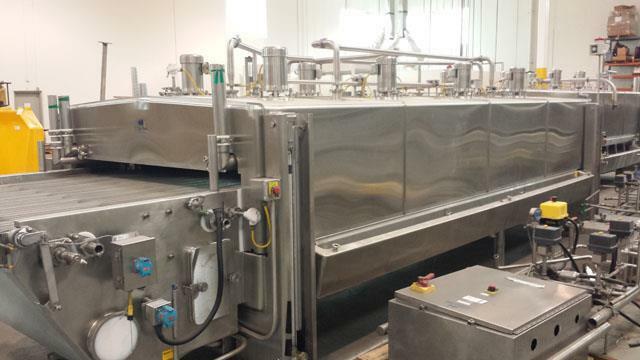 After the ice cream is processed in the chamber for a period of time, it can be extruded into a container. However, it’s worth noting that the product that is processed inside of the batch freezer usually isn’t the final product ice cream – normally what’s extruded from the freezer after processing must be stored in a blast freezer so that it can adequately solidify. Following this solidification, the ice cream can then be served. Although there is some debate about quality, it’s thought that most ice cream produced via this process is of higher quality than what is produced via the continuous freezer method. One neat thing to note about batch freezers is that they allow for a certain level of experimentation when it comes to creating new flavors and new types of frozen desserts. This can allow ice cream parlors to get creative with their offerings, and there’s minimal risk of falling short on a particular new flavor or delicacy, being that batch freezers only produce limited quantities. It’s also worth mentioning that batch freezers are typically less expensive than continuous freezers. Bottom line: To review, batch freezers are the ideal choice of ice cream-production equipment for ice cream parlors and shops. They can also be used by larger ice cream producers, but are really only applicable for very high-level flavors of ice cream that consumers will pay more for to ensure companies maintain profitable margins. As you can see, there are quite a bit differences between batch and continuous freezers. But aside from the products that they’re intended to create, there’s one other thing that these two types of freezers have in common with each other – their expense. Yes, while continuous freezers are generally more expensive than batch freezers, neither is a drop in the bucket when it comes to upfront cost. But they’re also crucial equipment that ice cream producers and ice cream parlors need to have – and need to have operating – in order to stay in business. But if a new piece of equipment is necessary and isn’t a part of the current upgrade plan, the high cost of such equipment can certainly put businesses in a bind. That’s where buying a used continuous or batch freezer can come in handy, especially when you do so from a credible resource like Bid on Equipment. By buying used, companies can get a previously owned piece for a cheaper price than they can brand new – and without sacrificing performance. For many businesses, this can be a big money saver. For more information on the difference between continuous versus batch freezers, and to browse Bid on Equipment’s selection of each, contact us today. Form fill and seal, or FFS, machines play a critical role in the packaging of goods. Specifically, they’re automated pieces of heavy machinery that work on a packaging assembly line. As the name implies, these FFS machines first help form the package, then they fill it with the desired product and, finally, seal it so that it can then be shipped to the store for purchase. Form fill seal machines can work with either dry goods or liquids, and are commonly used for all types of packaging (i.e. both corrugated and flexible styles) and with all different types of product, from foods to pharmaceuticals. In order to understand how an FFS machine works, however, we first need to separate such equipment into their proper categories. On that note, it’s worth mentioning that FFS machines generally are available in two different styles – vertical form fill seal, or VFFS, which are the more popular of the two, and horizontal form fill seal, or HFFS. VFFS are somewhat self-explanatory in the basics of their operation, working to form, fill and then seal packaging from above. Such machines are available in a few different varieties – single web and dual web. HFFS machines, on the other hand, work to package machines from a horizontal perspective (think things like blister packs and wrappers). There are a few key differences between HFFS and VFFS machines. For instance, HFFS machines generally take up a greater space on the plant floor than VFFS machines, which have been developed to be much more compact in recent years. VFFS machines are also often better intended to work with products that are difficult to handle by hand, things like grains, liquids, chips and other types of food. HFFS machines are better suited for standalone products, like toys or candy bars. HFFS machines are generally considered to be a tad more versatile than their VFFScounterparts in that they can handle a greater variety of packages and products, as opposed toVFFS machines, which are best suited to work with foods. Furthermore, both VFFS and HFFS machines can be further classified into the products that they’re designed to work with. For instance, categories of such machines include bags/pillow packs, bottles, cartons, trays and blisters, sachets and bags/pouches. While the operation of aform fill seal machine can vary based on the type of machine it is (VFFS or HFFS) as well as the type of package it is working on, all machines work under the same basic principles. The first step is the formation of the packaging material. Depending on the type of package that the machine is working on, this packaging material is either taken and made from a web roll (in the case of a plastic, flexible substrate) or taken from a stack of existing packaging (which is often normal when working with corrugated boxes or similar packaging materials). For a single web VFFS machine that works with flexible materials, for instance, the web, or film roll, usually is fed into a cone-shaped tube. This tube, also commonly referred to as the “forming tube,” helps form the package by taking the outer edges of the web roll and wrapping them around it. The film is then often worked outside of the tube and then sealed together to create the package. The package is then sealed at the bottom, any excess film below the seal is removed and the package is ready to go on to the filling stage of the process. The process is similar on flexible applications with the VFFS dual web machine, except that two rolls of film are used. 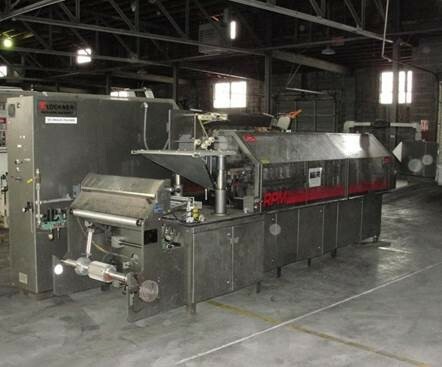 While VFFS and HFFS machines have a lot of work to do from a forming perspective when it comes to plastic film and packaging lines, when working with corrugated and other packaging materials, such machines generally just grab from an existing product pile or fold the edges into a product. After the packages are formed, they move on to the filling station. Following the forming step comes the filling step. This process works much more fluidly than the first task that these machines are programmed to complete. Simply put, a pre-measured amount of product, whether it’s a solid or a liquid, is dispersed from the machine and into the open package. Products are normally carried via a conveyor belt. After the packages are filled, they move on to the final main task – sealing. The final main task of a form fill seal machine is sealing the package so that it can ultimately be shipped off to the store for consumers to purchase. Sealing usually occurs immediately following filling, partially to reduce any potential contamination to the products being packaged, which is especially true if the goods are to be consumed. In many VFFS machines that work with bags and pouches, a sealing bar is positioned horizontally and works to seal off the top of the package. Following this step, and the removal of any material, the package can also move on for another sealing task when applicable, which is often referred to as the “final sealing process” or “secondary sealing.” For applicable packages, this may include filling the product with air to help protect or preserve it or punching holes in the package so it can be easier hung on display racks. Packages then move on to be sorted and, eventually, shipped out to stores. Today, VFFS and HFFS machines are highly technologically advanced, able to not only perform their tasks with extreme accuracy and precision, but they’re often also able to execute other important functions related to specific types of packaging, such as temperature adjustment. One other important thing to note about form fill seal equipment is that it is large capital equipment – equipment that tends to be very expensive, ranging from tens of thousands to even hundreds of thousands of dollars. This price tag can pose quite the burden for a packaging facility, especially if one has run into an unforeseen situation where a piece of equipment failed outside of that particular company’s determined upgrade and replacement plan. That’s where buying from a pre-used source such as Bid on Equipment can come in handy, as you can get a like-new piece of equipment at a used price. Saving on this type of integral piece of equipment is essential for some companies, and when you don’t have to sacrifice quality for affordability, it makes the situation all the more win-win. For more information on form fill seal machines, and to browse Bid on Equipment’s inventory of HFFS and VFFS machines, contact us today. What has been bringing buyers to Bid on Equipment through the month of January and what are they looking for when they are here? This last month we noticed a large increase in interest inConstruction Equipment including Construction Mixers, Construction Tools, and Construction Vehicles.